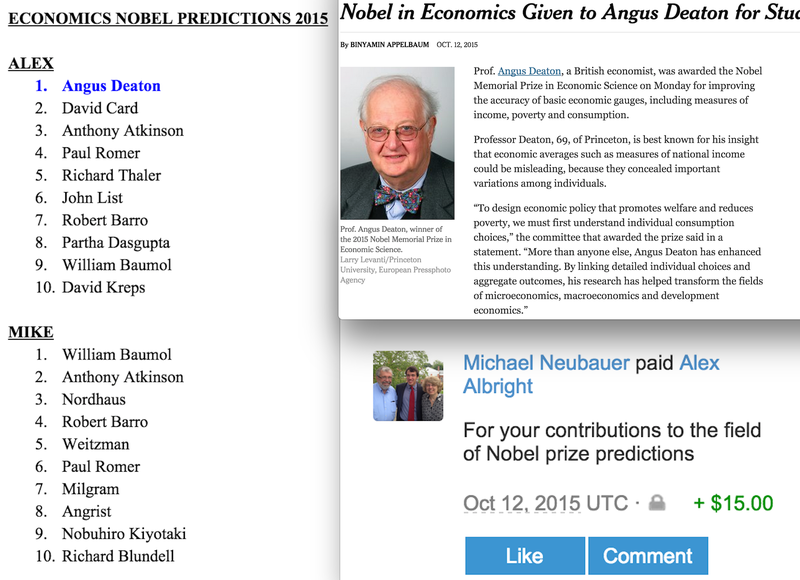 Many months ago, in October, the Economics Nobel prize was awarded to Angus Deaton. Beyond experiencing sheer joy at having beaten my friend Mike at predicting the winner, I also was overwhelmed by the routine, yearly backlash against the discipline in the form of articles shared widely across any and all social networks. Of particular interest to me this year was the Guardian’s piece “Don’t let the Nobel prize fool you. Economics is not a science.” The dialogue surrounding this article made me incredibly curious to investigate my own thoughts on the discipline and its place in the realm of “the sciences.” In a frenzy of activity that can only be accurately explained as the result of a perfect storm of manic energy and genuine love for an academic topic, I wrote up a response not only to this article, but also to my own sense of insecurity in studying a discipline that is often cut down to size by the public and other academics. In my aforementioned frenzy of activity, I found myself constantly talking with Mike (in spite of my status as the superior Nobel forecaster) about the definition of science, hierarchies of methodologies for causal inference, the role of mathematics in applied social science, and our own personal experiences with economics. Eventually, I linked the Guardian article to him in order to explain the source of my academic existential probing. As another economics researcher, Mike had a similarly strong reaction to reading the Guardian’s piece and ended up writing his own response as well. So, I am now (albeit months after the original discussion) using this space to post both responses. I hope you’ll humor some thoughts and reactions from two aspiring economists. I developed a few behavioral ticks in college when asked about my major. First, I would blurt out “Math” and, after a brief pause of letting the unquestioned legitimacy of that discipline settle in, I would add “and Econ!”–an audible exclamation point in my voice. I had discovered through years of experience that the more enthusiastic you sounded, the less likely someone would take a dig at your field. However, nonetheless, I would always brace myself for cutting criticism as though the proofs I attempted to complete in Advanced Microeconomics were themselves the lynchpin of the financial crisis. While comparing strides in economic methods to the contributions of peace prize recipients is akin to comparing apples to dragon fruit, Luyendijk does have a point that “[m]any economists seem to have come to think of their field in scientific terms: a body of incrementally growing objective knowledge.” When I first starting playing around with regressions in Stata as a sophomore in college, I was working under the implicit assumption that there was one model I was seeking out. My different attempted specifications were the statistical equivalent of an archeologist’s whisks of ancient dust off of some fascinating series of bones. I assumed the skeleton would eventually peek out from the ground, undisputedly there for all to see. I assumed this was just like how there was one theorem I was trying to prove in graph theory–sure, there were multiple modes of axiomatic transport available to end up there, but we were bound to end up in the same place (unless, of course, I fell asleep in snack bar before I could really get there). I quickly realized that directly transplanting mathematical and statistical notions into the realm of social science can lead to numbers and asterisks denoting statistical significance floating around in zero gravity with nothing to pin them down. Tying the 1’s, 3’s, and ***’s down requires theory and we, as economic actors ourselves who perpetually seek optimal solutions, often entertain the fantasy of a perfectly complex and complete model that could smoothly trace the outline and motions of our dynamic, imperfect society. Jorge Luis Borges, the Argentine writer, once wrote a short story – a single paragraph – that is perhaps the best guide to the scientific method. In it, he described a distant land where cartography – the science of making maps – was taken to ridiculous extremes. A map of a province was so detailed that it was the size of an entire city. The map of the empire occupied an entire province. In time, the cartographers became even more ambitious: they drew a map that was an exact, one-to-one replica of the whole empire. As Borges wryly notes, subsequent generations could find no practical use for such an unwieldy map. So the map was left to rot in the desert, along with the science of geography that it represented. Borges’s point still eludes many social scientists today: understanding requires simplification. The best way to respond to the complexity of social life is not to devise ever-more elaborate models, but to learn how different causal mechanisms work, one at a time, and then figure out which ones are most relevant in a particular setting. In this sense, “focusing on complex statistical analyses and modeling” does not have to be to “the detriment of the observation of reality,” as Luyendijk states. Instead, emulating the words of Gary King, theoretical reasons for models can serve as guides to our specifications. In my mind, economics requires not just the capability to understand economic theory and empirics, but also the humility to avoid mapping out the entire universe of possible economic interactions, floating coefficients, and greek numerals. Studying economics requires the humility to admit that economics itself is not an exact science, but also the understanding that this categorization does not lessen the impact of potential breakthroughs, just maybe the egos of researchers like myself. via xkcd. WHERE IS ECONOMICS? Economics is an incredibly diverse field, studying topics ranging from how match-fixing works among elite sumo wrestlers to why the gap between developed and developing countries is as large as it is. When considering a topic as broad as whether the field of economics deserves to have a Nobel prize, then, it is important to consider the entire field before casting judgment. Joris Luyendijk, in his article “Don’t let the Nobel prize fool you. Economics is not a science,” directs most of his criticisms of economics at financial economics specifically instead of addressing the field of economics as a whole. We can even use Mr. Luyendijk’s preferred frame of analysis, Nobel prizes awarded, to see the distinction between finance and economics. Out of the 47 times the economics Nobel has been awarded, it was only given in the field of Financial Economics three times. And in his article, Mr. Luyendijk only addresses one of these three Nobels. I would argue that since financial economics is but a small part of the entire economics field, even intense criticism of financial economics should not bring the entire economics field down with it. A closer look at the Nobels awarded in financial economics reveals that the award is not “fostering hubris and leading to disaster” as Mr. Luyendijk claims. The first Nobel awarded in financial economics was presented in 1990, for research on portfolio choice and corporate finance and the creation of the Capital Asset Pricing Model (CAPM). Far from causing financial contagion, to which Mr. Luyendijk hints the economics Nobel prize has contributed, optimal portfolio theory examines how to balance returns and risk, and CAPM provides a foundation for pricing in financial markets. More recently, the 2013 Nobel was again awarded in financial economics, for advances in understanding asset pricing in the short and long term, applications of which include the widely used Case-Shiller Home Price Index. So if economics is not finance, then what is it? I would argue that an identifying feature of applied economics research is the search for causality. Specifically, much of economics is a search for causality in man-made phenomena. To model human behavior in a tractable way requires making assumptions and simplifications. I have to agree with Mr. Luyendijk that economics needs to be more forthright about those assumptions and limitations – economists may be too eager to take published findings as “timeless truths” without thinking about the inherent limitations of those findings. Failing to realize the limitations of such findings can come back to bite. For example the Black-Scholes model assumes that securities prices follow a log-normal process, which underestimates the probability of extreme events, such as the ones that led to the collapse of Long-Term Capital Management. But the failure of some to pay attention to well-known limitations of important findings should not diminish economics as a whole. Applied economics is also distinct from other social sciences in that it attempts to apply the tools of the hard sciences to human problems. I agree with Alex and Mr. Luyendijk that knowledge about the physical and human worlds is inherently different. The heterogeneity of human behavior creates messy models, and these models require the creation of new mathematical and statistical methods to understand them. This “mathematical sophistication” that Mr. Luyendijk bemoans is not just math for math’s sake, it is using tools from the hard sciences to explain real-world phenomena (and what’s wrong with pure math anyways?). Despite the occasional messy solution, the ideal study in applied economics is still a controlled experiment, as it is in many hard sciences. In the human world, however, this experimental ideal is difficult to implement. Much of applied economics thus relies on quasi-experimental methods, trying to approximate experiments with observational data by finding natural experiments, for example, when controlled experiments are not feasible. Still other branches of economics use actual economic experiments, such as randomized control trials (RCTs). The idea behind economics RCTs is the same as that behind clinical drug trials, where people are randomly separated into treatment and control groups to test the effect of an intervention. RCTs have become increasingly popular, especially in development work, over the past decade or so. Given Mr. Luyendijk’s concern about how divorced from the real world economics has become, he would be impressed by the amount of practical, detailed planning required to successfully implement RCTs, and be taken aback by how different this fieldwork is from the academics spending all day thinking of complex and impractical models that he envisions. A Nobel prize in economics will probably be awarded for advances in the methodology and applications of RCTs, the closest economics can come to the hard sciences that Mr. Luyendijk so reveres, sometime in the next decade. What will he say then? Mike and I were Research Assistants at Williams College together during summer 2013. Mike is currently on a Fulbright in China working with Stanford’s Rural Education Action Program, which conducts RCTs in rural China. We are both happy to hear any feedback on the linked articles and our responses, as we are both genuinely interested in thinking through where economics (and computational social sciences on the whole) should belong in scientific dialogue.